automatic frozen yogurt machine that dispenses in a matter of seconds. Are you hungry? No matter if you’re starving or if you just want a little treat, you’re sure to find a nearby vending machine that will provide you with a little something to tide you over. Vending machines are commonplace around the world. And vending machines no longer just sell a can of soda, a bottle of water, a Snickers bar, or a small bag of chips. Today’s vending machines sell a wide variety of items. Live crabs, caviar, lettuce, pizza, bananas, mashed potatoes, French fries, eggs, hot dogs, pecan pie, and much more! But none of these out-of-the ordinary vending machines are as interesting to us as FroBot – a brand new vending machine concept that allows users to purchase frozen yogurt from an actual frozen yogurt machine that dispenses 7-ounce servings of fresh froyo in a matter of seconds. The cost of a cup of frozen yogurt from a FroBot vending machine is just $3 – which is payable only via a credit card. Because the idea of converting an actual soft serve frozen yogurt machine into a vending machine is so innovative, it caught the attention of National Public Radio (NPR). Extensive details about the automatic frozen yogurt machine were described in great detail in an article published on NPR’s website. The NPR article included an interview with FroBot’s founders, Jeremy O’Sullivan and Melissa Nelson. NPR is an organization that describes itself as a service dedicated to “telling stories small and large that start conversations, increase understanding, enrich lives, and enlighten minds.” And according to this article, thanks to FroBot, frozen yogurt machines are being taken where they’ve never been before. The FroBot concept is quite simple. It involves 1) customers who are looking for a fresh snack or treat, 2) the selection of a flavor via a touch screen, and 3) a credit card payment of $3. The founders of FroBot are based in Southern Virginia and both attended college in a small Pennsylvania town. During their years of college, they realized they had limited options when it came to frozen treats. Over the course of several years, their idea for FroBot – the easiest frozen yogurt machine vending machine ever invented – was born. Unlike frozen yogurt franchises and independently owned frozen yogurt shops that require potentially hundreds of thousands of dollars to start, O’Sullivan and Nelson estimated that the FroBot automatic frozen yogurt machine idea seemed like a much less expensive option. Vending machine food serves a need. Even though some vending machines around the world sell unusual or unique items, the majority of vending machines sell food that is pre-packaged. 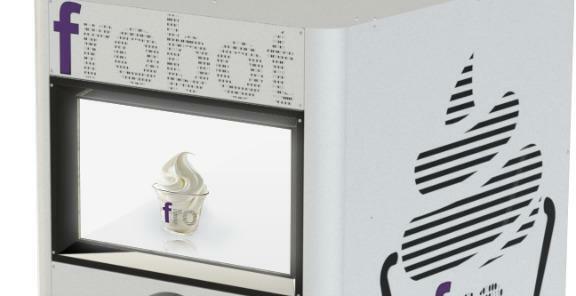 With the frozen yogurt offered in FroBot frozen yogurt machine vending machines, fresh options open a whole new frontier! Recent articles that have been published on FroBot say that the company’s founders are currently beta testing their FroBot automatic frozen yogurt machine in the field. More information on FroBot is available on the company’s website, www.FroBot.net.